Every time I wander through Kirkgate Market in Leeds, I end up walking up the row of fishmongers towards the exit to Vicar Lane, and past the very last fishmonger, the best of the lot, the one with the stall laden with bright, clean fish and shellfish, packed in ice. There’s always a box of live crabs, and next to it a box of lobsters, normally with a kid in a pram parked in front of them, staring in wonder at these weird creatures of the sea, their claws bound with rubber bands to protect us and them, strange tentacles feeling around their polystyrene home. The other day, I took the plunge and bought a lobster, a stunning Cornish creature with a mottled brown shell, flecked with red and blue, distinctly different the Canadian cousins it shared its box with. The Cornish lobsters were at their prime, and looked fresher and livelier, given the considerably shorter journey they’d taken from the deep waters of the Atlantic ocean off the southwest coasts. These were prime lobsters – big, strong, vigorous, with powerful claws and rock hard shells. A medium-sized one cost me about fourteen quid not cheap, but not a bad price for something of such obvious quality and freshness. So, lobster home, safely cooped up in the sink. What to do next? There’s more advice on the Internet about the most humane and kindest way to despatch a lobster than I could describe at this point, but methods tend to fall into two camps – use a knife, or plunge the lobster straight into boiling water, with a side argument about whether partially freezing the doomed crustacean is a good or a bad thing. Much advice is contradictory, much is frankly a little farcical – putting a live lobster in a freezer for two whole hours is most certainly going to numb it, but it’s also going to freeze it solid, which can’t be a good way to go, either for the lobster or the cook. I opted for a quick, decisive and simple method, taking the lobster in a damp tea towel, flipping it onto it’s back and cutting through the head with a large kitchen knife before immediately placing the crustacean in a large pan of boiling salted water. It’s a nasty business, but it’s quick, and the animal is dead before it hits the water. I think that pre-killing is vital, and I can’t agree with the ‘plunge straight into boiling water’ school of thought, nor do I think that freezing beforehand is particularly kind, either. Better to be firm, decisive and quick with a sharp blade. None of this is pleasant. None of it is particularly nice, and the business is controversial to say the least, but it’s what needs to be done if you want to eat lobster, and if you’re going to eat lobster, you’d better be certain that you’ve got the nerve to kill it quickly, cleanly and efficiently. 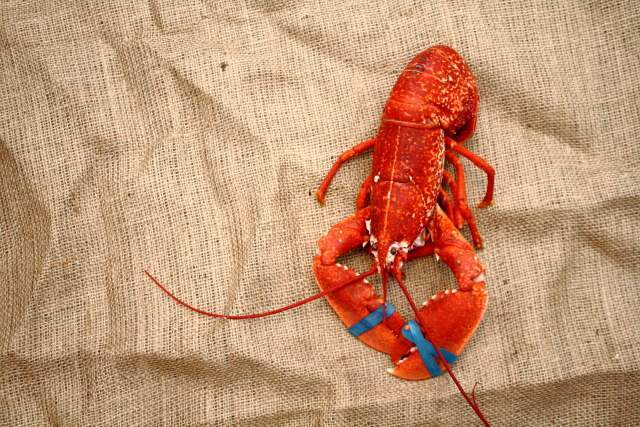 Lobster is best boiled for about ten or fifteen minutes in plenty of water, turning a characteristic bright red colour. Once cooked, the claws need to be cracked with the back of a heavy knife, and the body is usually sliced in half length ways, with the long, dark vein that runs down the body picked out before serving. I ate my lobster with nothing more than chips, some melted butter and a squeeze of lemon, and it was delicious in its simplicity, nothing more than the concentrated taste of the sea, creamy, rich flesh highlighted by a slick of butter and a dash of citrus. It felt decadent, and perhaps it was – sitting in my kitchen with this symbol of luxury, this thing that I’d killed myself and cooked immediately. I felt humbled by the process, and it brought me closer to the idea of killing for food, made me stare straight into exactly what it meant to be a carnivore in this world that removes and sanitises the real truths of the food chain, distances them from the way that food is presented as a packaged commodity. Here was something that I’d done myself, that I’d taken through the whole process of killing, preparing, cooking and eating. There was no escaping the raw facts, even as I ate my meal, the wet knife still sat on the chopping board, the steaming pan on the stove. I hope I’d done it with respect and some dignity. I hope I’d done it as quickly as I could. I hope I’d done it well. And for what it’s worth, I agree – kill them swiftly before cooking seems the most humane way. I’ve been out lobster potting in Runswick Bay. You’re right about appreciating the reality of the food chain. I still have uncomfortable memories as an 11 year old sea scout on a Scottish Island watching a crab we’d caught being boiled alive. A lot of thrashing around..